A resident clears dead fish from the Fu river in Wuhan, in central China’s Hubei province on September 3, 2013. Hundreds of thousands of dead fish were left floating in a Chinese river after a chemical discharge, officials said Wednesday, the latest industrial accident to pollute the country’s battered environment. 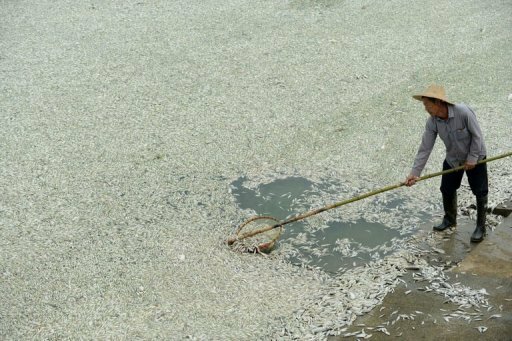 BEIJING (AFP) – (AFP) – Hundreds of thousands of dead fish were left floating in a Chinese river after a chemical discharge, officials said Wednesday, the latest industrial accident to pollute the country’s battered environment. About 100,000 kilograms of fish were cleared from 40 kilometres of the Fu river in Wuhan, the capital of the central province of Hubei, the official Xinhua news agency said, citing “local government investigations”. Xinhua said the probe found ammonia levels “far in excess of the national standard” at a drain outlet from Hubei Shuanghuan Science and Technology, a chemical manufacturer. A local environmental official surnamed Xiao confirmed the Monday incident to AFP and said operations to clear the fish had been concluded in most of the affected areas. The fish were mainly carp, chub and snakehead, he added. Around 2,000 villagers nearby earn their living from fishing, according to Xinhua. The incident was one of the most discussed topics on China’s hugely popular version of Twitter, Sina Weibo, on Wednesday. “We have to protect our environment,” said one poster. “Why hasn’t the person responsible for this resigned yet?” asked another. The contamination came after more than 16,000 dead pigs were recovered from a river which runs through the commercial hub of Shanghai earlier this year. The scandal highlighted China’s troubles with food safety, adding the country’s most popular meat to a growing list of items rocked by controversy.